Debuting at CES 2019 is the Asus Chromebook C434 flip model but the device is still in the works. Even so, on paper, it has just about everything you’d want in a follow up to the Flip C302, from fresh new processors to a large display with minimal bezels. About the only thing missing would be a digital stylus and support for it with the Asus Chromebook 434. That display is a big upgrade from the C302, which only showed 45% of the NTSC color gamut. This one supports 100% sRGB color, which is a huge improvement. 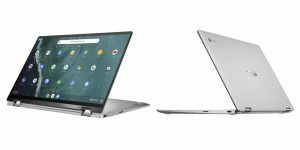 Aside from the step down from Intel U-Series to Y-Series chips, as well as screen resolution, the new Asus Chromebook C434 is similar to the Acer Chromebook Spin 13. I’m thinking that the similarly configured Asus Chromebook C434 models will be between $100 and $150 less than the 13 Spin. Extrapolate that out and you get $650 or so for the mid-range C434, with the base hopefully starting at $549 to $599. The information for this post was taken from an article by Kevin C. Tofel in About Chromebooks, follow this link for the complete article and more details. Here are some additional sources to get different viewpoints on this new model: liliputing, 9TO5Google, Slash Gear, ANDROID POLICE, and GADGET BRIDGE.